At least 20 people may have been killed when a high-rise building engulfed by fire collapsed in downtown Tehran, in what was described as being like a "scene from a horror movie." Over two dozen firefighters are thought to be buried under the rubble. 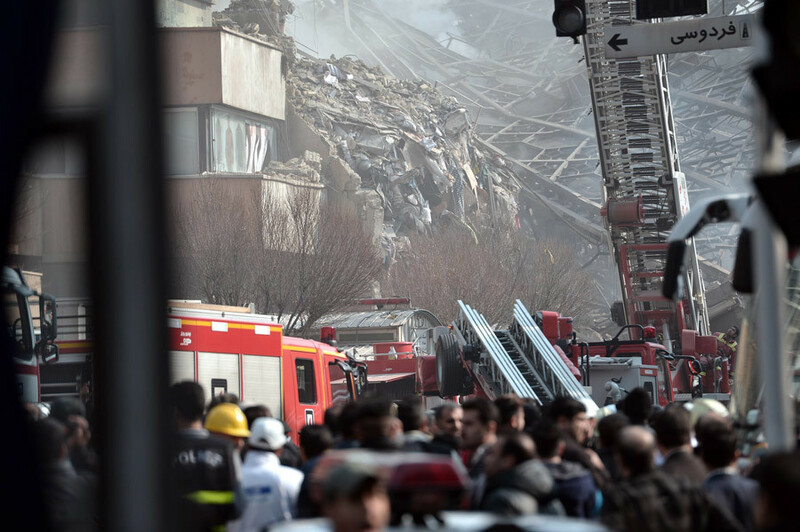 "So far, more than 20 of our colleagues in the fire brigade have lost their lives rescuing others," Tehran’s mayor Mohammad Bagher Ghalibaf told state television. However, a fire brigade spokesman could not confirm the deaths and said the bodies were yet to be pulled from the wreckage. A rescue operation is now underway to save those firefighters who are still trapped under the debris. "About 25 firefighters are trapped inside and rescue teams are trying to get them out," Mayor Qalibaf told state TV from the scene, according to Reuters. "Our main worry is about those firefighters trapped under the rubble," Pir Hossein Kolivand, head of the Emergency Medical Services, told IRNA news agency. "All the nearby hospitals are on alert." Police have cordoned off the area, and rescue teams are on their way to the scene, state-run Press TV reported. At least 75 people, 45 firefighters among them, were hurt when the high-rise came crashing down Thursday morning, state TV reported. The owner of a nearby grocery store told Reuters: "It was like a horror movie. The building collapsed in front of me." "The flames could be seen kilometers away from the old building," the Fars news agency reported. 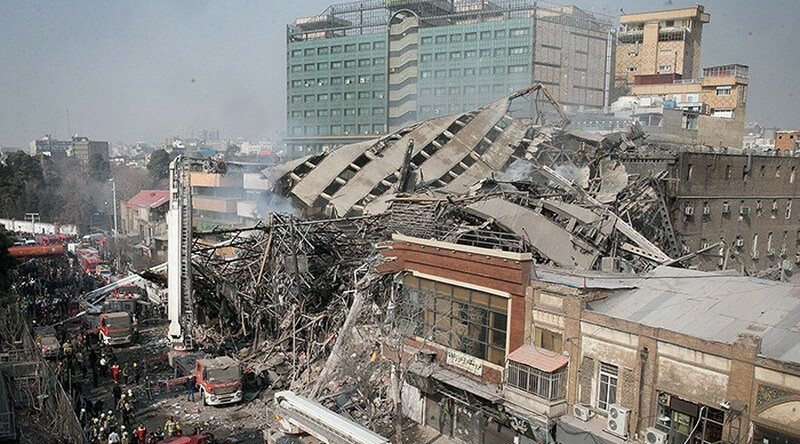 President Hassan Rouhani ordered "an immediate investigation" into the cause of the collapse, IRNA reported. The commercial building in southern Tehran is one of the oldest in Tehran, it said. The building came down in a matter of seconds, with a thick plume of smoke instantly rising over the site. 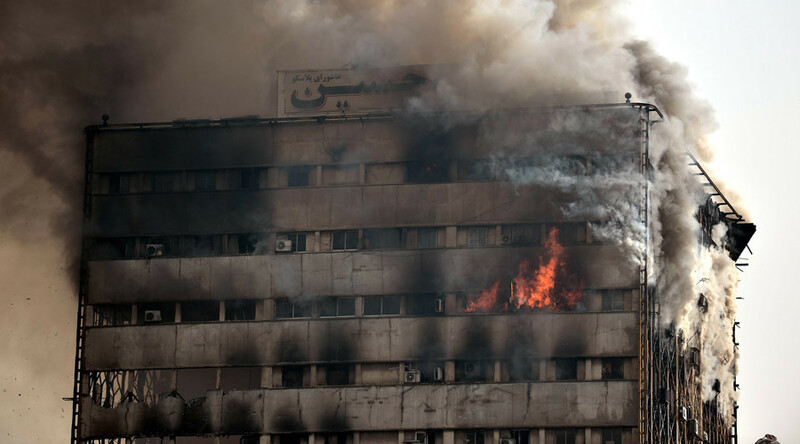 The fire spread throughout the seventeen-story building in the early hours of Thursday morning, despite efforts by Tehran firefighters to put out the blaze, IRNA reported, adding that Plasco Trade Center is the biggest in the Iranian capital. “We had repeatedly warned the building managers about the lack of safety of the building,” Fire Department spokesman Jalal Maleki said, as quoted by AFP. “Even in the stairwells, a lot of clothing is stored and this is against safety standards. The managers didn't pay attention to the warnings,” he added. The tower, located on Jomhoori Avenue, was built in 1962 and named after a plastics manufacturing company. The Plasco building includes a shopping mall and clothing workshops.